It is a classic sterilising fluid. You can't beat the old classic that is Milton. Used for years, multi purpose and smells like hygiene. This is the greatest around. 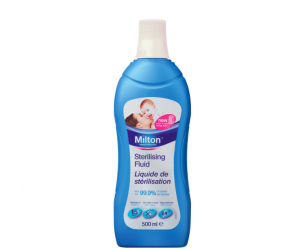 Milton gives you a sense of good hygine knowing that all items and surfaces that is is used on will be clean and safe for little ones, the product is super easy to use just add to a bit of water and leaves a lovely smell afterwards. It's a must have for cleaning baby feeding equipment and for everyday use around the home. Can be found in lots of shops at very good price in comparison to others. Easy to use, just add to water. Handy when you have a baby to look after at the same time. This smells so fresh, cleans well, removes milk smells. I use it for so many things around the house too, lily pollen stains, food stains on babies white clothing or bibs, wiping surfaces, chopping boards, floors, highchairs, bathrooms, floors and door handles. I use it to wipe over radiators and when he heating comes on the house smells fresh and clean. Although I didn’t need to use this as my bottles were self sterilising, I sometimes felt that needed that extra clean so used this. It gave me the sense of cleanliness and hygiene and I was happy to use these on my bottles. However I found that the bottle teats turned white once using it in cold water and that was the only downfall I found. This product is quick easy and fills you with confidence that your items are fully clean and sterile! I use it on everything from bottles, dummies, teethers and toys. The only downside I find to using it is it recommends using it with cold water, but this turns the teats white. Bleached your clothes, smells strong! I bought this sterilising fluid when I was breastfeeding and expressing with a pump. I was finding it a chore to clean my pump after each use but knew it was important to do so. I bought this sterilising fluid and never looked back. During the night once pumped I take a large lunch box and fill it with warm soapy water in the bathroom to wash, I then pour in warm water and sterilising fluid and put the lid on the lunch box. The sterilising fluid stays there until I’m ready to use the pump again, I know it is clean and safe to use. This has saved me so much time in the night not having to walk up and down the stairs half asleep to wash all the pieces of the pump. The smell is very strong like chlorine and if you accidentally splash it will stain your clothes so just be careful with it which isn’t always easy at 3am when you’re trying to be quick! So.. I've used this with both children.. but found if sterilized in cold water, it makes the teat of the bottle go white which then doesn't change. Once switched to the microwave (MAM), the bottle teat would then go yellow. Would recommend using hot water but overall good product. Smell, easy to use, safe for children. I have used this as a parent and a nursery practitioner, it's my go to for everything!. I use it for -Toy cleaning, Bottle sterilizing, Dummy sterilizing, Cleaning down my babies walls in her room and her furniture and a little trick is it takes all the yukky grim out off the bottom of the toilet bowl top product. Quick, easy and you don’t need to think about it for about 15 minutes. Smells clean, full trust in that the bottles have been sterilised. This is also good for getting tough stains out of clothes also. Quick and easy and love the product. Started use after wee one teach 1 for bottles dummy and other item been easy enough to use good for bibs that really dirty too keep highcjairs and feeding ares good with the wipe form too. It will sterlise bottles for baby..
Comes in a good size bottle for storage. You can find this in all supermarkets. I've used this with my cold water steriliser, it's a lot easier and prefer it to the Milton tablets but it does make the dummies and teets yellow and cloudy which I don't like because it makes them look dirty. Makes sterilising super easy! And smells so fresh and clean. Really easy to use, would definitely recommend to parents in a rush! Love this ! Makes sterilising so simple and quick. I love the smell of it and seems to do great job at ensuring things are clean. I found it very affordable, available in lots of shops. The bottle also seemed to go on forever. Would recommend a bottle to keep in you cupboard. I love the Milton sterilising liquid. It has clear instructions on bottle for use. I have always used this to sterilise my babies bottles, smells clean and is very safe and quick way to make all accessories sterile. I love this product! Not only do i use it for sterilising my little ones bottles, its also great for getting food stains out of her clothes to! I used this when I went on holiday. It was so handy to take away and use whilst there. It doesn’t have a strong smell and does the job. 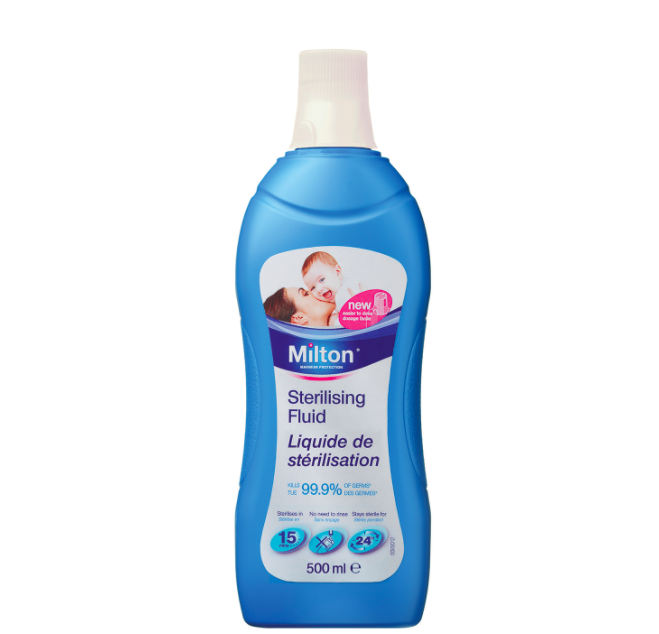 Sterilise feeding equipment in just 15 minutes with Milton Sterilising Fluid 500ml. No need to rinse after use and perfect for on the go feeds.